The 15 cm sIG 33 (schweres Infanterie Geschütz 33, lit. "Heavy Infantry Gun") was the standard German heavy infantry gun used in the Second World War. It was the largest weapon ever classified as an infantry gun by any nation. Sources differ on the development history, but the gun itself was of conventional design. Early production models were horse-drawn, with wooden wheels. Later production models had pressed steel wheels, with solid rubber tires and air brakes for motor towing, albeit at a low speed (only carriages with pneumatic tires and suspension system could be towed at highway speeds). As with most German artillery carriages, the solid rubber tires and lack of springing meant that the gun couldn't safely be towed above 10 mph, and horse-drawing was still extensively employed. The sIG 33 was rather heavy for its mission, and it was redesigned in the late 1930s to incorporate light alloys. This saved about 150 kilograms (330 lb), but the outbreak of war forced the return to the original design before more than a few hundred were made, as the Luftwaffe had a higher priority for light alloys. A new carriage, made entirely of light alloys, was tested around 1939, but was not accepted for service. Most of the shells used by the sIG 33 were unexceptional in design, but the Stielgranate 42 was different in fundamental ways from ordinary shells. The driving rod was loaded into the muzzle so that the finned projectile remained in front of, and outside, the barrel entirely. A special charge was loaded and would propel the projectile about 1,000 metres (1,100 yd). At about 150 metres (160 yd) distance, the driving rod would separate from the projectile. Unlike other Stielgranaten, this version was not intended for anti-tank use, but rather for the demolition of strongpoints and clearing barbed-wire obstacles and minefields by blast effect. Wikimedia Commons has media related to 15 cm sIG 33. 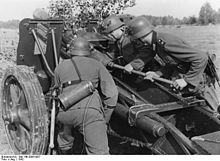 15-cm Heavy Infantry Howitzer, German Infantry Weapons, Military Intelligence Service, Special Series No. 14, May 25, 1943.